January 18, 2011 / A10 Clinical Solutions, Inc. I went to the gym today. It’s been a while. The reason that I stopped is much too painful and complicated to share with you now. But I will some day; but not now. While on the elliptical, I thought about the responsibilities I have to my company. I’m building an institution of groundbreaking healthcare research and disease prevention programs that are cutting edge and that will change how healthcare is delivered in the future. However, I’m talking the talk, but realized I stopped walking the walk. I owe it to my employees at A10 Clinical to demonstrate that we can control costs by staying healthy both physically and mentally. We can increase revenues by feeding the body and brain with the best nutrition that will open our mind-cells for new innovative thoughts. I owe it to myself to move my body often and get my required sleep because it just feels better than working on the computer all day and night. 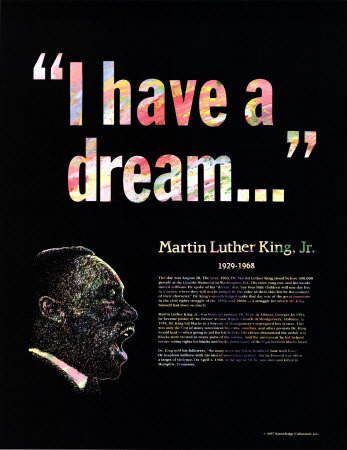 Today is Dr. Martin Luther King’s birthday and I too, had a dream. I dreamt that I could be the best person that I can, both inside and out. I dreamt that my words would be inspiring to some and my actions are valuable to most. Yes, I had a dream this morning, a glorious dream indeed. I dreamt I can show all interested women and minorities that starting a business doesn’t have to remain a dream. Growing a business is possible now and it’s good for our families and great for the nation. I dreamt and I still dream as I‘m writing this that A10 will meet its remarkable and admirable mission to be a clinical powerhouse that heals the world. Just like back in 1963 when Dr. King gave us hope that our nation could heal; I believe our world will be healed of diseases, war and bias. I have an enormous dream, a focused dream that I will work alongside my extraordinary staff to continue to build a center of excellence for health research and quality healthcare delivery programs. I dream that we attract only the best and well intended clients and employees to the company. I dream because it was Dr. Martin Luther King, Jr. who sacrificed his life so that I could have endless dreams but most importantly have the opportunity to turn my dreams into reality. Guest Blog: Upside Down Roller Coaster, Here I Come! Sit, Stay, RUN! Good Girl!